The sport of “Tactical Fitness” has arrived. We bring Tactical Training and Tactical Fitness together under one roof for those seeking to add more to their workouts. Located inside the SGI Regional Training Center is a 2,200 sq. ft. strength and conditioning facility operated by Centric Athletics. This innovative training center is truly an “Institute for Human Performance” offering a wide range of Sports-Specific Training, Crossfit, Tactical Fitness, Weight Lifting, Weaponless Defense, Weight Loss, Personal Training, and a variety of other Strength & Conditioning programs. In addition, our trainers can help plan your next team-building event, or our mobile training cadre can come to your place of business to lead a group workout! Centric Athletics serves as a consulting and beta-testing site for some of the industry’s top manufacturers – so our clients will get first crack at some of the latest cutting edge technologies and equipment to use in their workouts. The Centric Athletics facility is open to the public and allows our public safety members 24/7 access through our secure keyless entry system for those wanting to work out after hours. Whether you’re interested in Crossfit, Strength & Conditioning, Tactical Fitness, or Weight Loss, we have a coach led group class or one-on-one custom program for everyone. Thinking about a career in law enforcement or fire service? Are you prepared? Ask about the Centric Physical Preparedness (C-PREP) Class for Law Enforcement and Fire Service candidates. 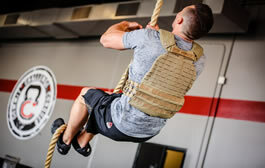 Skills required for the physical fitness test include, sit-ups, push-ups, running specific distances in set times, climbing a fence/wall, and lifting weights that simulate the real life weight of a person or object. This is an introductory class that will focus on the necessary training required to successfully pass these tests. We recommend that this class be part of an existing workout regimen to properly prepare each candidate for the total academy experience.